Over the past year, Melanie Nuce, SVP Corporate Development at GS1 US, has worked to raise awareness of blockchain for supply chain applications — from improving food traceability to enhancing product information transparency. Drawing on more than 20 years of supply chain experience, Melanie educates various organizations and companies on the value of creating interoperable systems that leverage standards before launching into blockchain initiatives. Recently, Food Online sat down with Melanie to discuss blockchain in the food supply chain and how to separate hype versus reality. Food Online: Why is blockchain gaining momentum as a game-changer in the food industry? Melanie: Blockchain has the potential to be a real game-changer because it can enable more widespread data sharing. It is impossible to implement blockchain if you still operate in data silos. For some industries, this is a very unfamiliar concept. However, the food industry understands the need to share product data with trading partners because of the traceback requirements to support product recalls outlined in FSMA several years ago. Manufacturers already prioritize quality data not only to know where product came from and who it was sold to, but also to share product attributes directly with consumers. 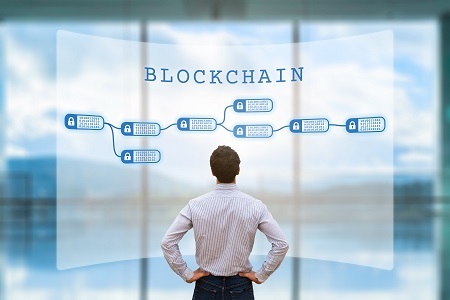 What’s interesting about the “blockchain hype” is that it has brought to the forefront the need for companies to automate their recordkeeping and traceability systems and eliminate the manual, often paper-based processes that slows traceability. For example, during the investigation into the romaine lettuce E. coli outbreak, many were questioning whether or not blockchain could have helped. But, it’s impossible to implement blockchain without having basic supply chain visibility business processes in place. Implementing GS1 Standards, whether you’re completely new to the system or leveraging an existing investment, help provide all trading partners with a single source of the truth—everyone is working off of the same set of data in the same format. That data is consistent from supplier to manufacturer to distributor to retailer or operator, and can be executed without human intervention, which makes the GS1 System of Standards harmonious with blockchain. Food Online: How does blockchain work in the food supply chain? Melanie: Blockchain is a type of distributed ledger technology that decentralizes data exchange. Traditional centralized systems are often inefficient and vulnerable to data breaches because data is housed in a single location. A decentralized system ensures data is replicated, shared, and synchronized across multiple geographic locations, providing visibility to all parties. This structure makes the data more trustworthy and more resilient to any kind of organizational or technical failure. Information is also immutable on a blockchain, meaning it cannot be modified or deleted. Couple immutability with “smart” contracts — meaning the automated execution of previously defined terms and conditions — and a trading partner is prevented from writing a business transaction to the blockchain ledger that is outside of the rules specified. This could lead to more certainty around what is being shipped and when. This level of automation can reduce the time it takes to trace products in the supply chain. In other words, what currently takes upwards of weeks can be done in minutes and it can be fully-documented with more certainty about transformational events and stops in the supply chain. Blockchain’s immutability also provides the level of transparency that is needed to ensure complete product chain of custody. A company can make sourcing information visible like Cargill’s pilot; prove how they are offsetting environmental impact like Ben and Jerry’s have done; that fair wages were given to laborers as Coca-Cola recently announced; and many more possibilities. Blockchain could play a major role in keeping food manufacturers relevant to today’s consumers who consider transparency as important to their purchase decision as the traditional factors of quality and price. Food Online: Can you explain why some analysts and industry stakeholders are skeptical about what blockchain can deliver? Melanie: Many are skeptical because blockchain as a technology can sometimes be overhyped without enough emphasis on the use cases and the long term benefit of decentralized data sharing. By staying educated on the developing use cases for blockchain, each individual company is armed with the knowledge to determine if their challenges can be solved similarly by testing blockchain. The reality is that blockchain is just one avenue for fulfilling a business goal — it cannot replace best business practices or be a company’s main innovation tool. For example, data managers are already well aware blockchain will do nothing to solve existing data quality issues. If trading partners don’t make a serious effort to clean up supply chain data and change their business processes for sustaining quality data, they just won’t get to a place where blockchain serves them. Food Online: What is the best way for food manufacturers to ensure a successful blockchain pilot? 1) Do I have systems interoperability? To enable supply chain visibility, internal systems need to be able to communicate with trading partner systems. This is what makes it possible for a small, remote farm to connect with a packer, manufacturer, distributor, and eventually a retailer or foodservice operator. To capture how a product changes hands throughout the supply chain in a uniform way, an upstream supply chain partner must globally identify products (not just with internal numbers). Specialized barcodes, called GS1-128 barcodes, already provide the ability to encode traceability information, such as expiration date, and the batch or lot that the product came from at the case level. Without this basic supply chain visibility, blockchain will not be effectively delivered. 2) Have I prepared my data for blockchain? Without quality data, blockchain will only expedite the movement of incomplete or otherwise faulty data. For example, a missing allergen from an ingredient listing can not only cause a consumer safety issue, but damage a brand long term when a consumer takes to social media to voice their frustration. Aside from any blockchain plans, companies need to first evaluate how much their inaccurate or incomplete data is becoming a liability. 3) Are the right standards in place that will allow for solution choice? Not all companies are going to select the same technology partner to implement blockchain. Standards help companies structure their data and prepare it to be shared in a consistent format. So, regardless of which vendor’s solution I pick, I have eliminated internal data silos and can effectively leverage the power of blockchain. With these three interoperability considerations prioritized, manufacturers are not only set up for a successful pilot, they are simply instituting best business practices that could have positive implications beyond the single use case they test. Many companies see blockchain moving from the pilot phase to support the massive exchange of data that will come with the expansion of the Internet of Things. Blockchain will enable the flow of data to create more personalized consumer experiences, including the ability to reach into consumers’ homes with data for upselling, cross-selling, and automated replenishment of products. It’s truly an exciting time to be exploring this technology. Melanie Nuce is the senior vice president, corporate development, GS1 US,  with more than 20 years of experience in supply chain technology. She oversees a team that investigates new technologies, partnerships and investment opportunities to increase the relevance and reach of GS1 Standards in e-commerce, mobile, social media and supply chain business processes. More information is available at www.gs1us.org.